The home more than met our expectations - great location by the lake,very nice deck and very functional kitchen. The house was not "fancy" but more than met our needs - would not hesitate going back there. Sandy Beach was everything I wanted. It provided the rustic atmosphere that camping brings with the comfort of a permanent shelter. The site was secluded from others, offered ample room, and having a private beach solidified the spot as one of my favorites from my many travels to the area. I indeed hope to make it back soon. Seagull is a very nice place to stay. The shoreline is excellent for wave watching. Fun classic interior and in great shape! Caribou Crossings was well appointed and cozy. Dock on the lake was beautiful. Video collection was outstanding! This was such a gorgeous home, we felt privileged to stay there! The location was awesome with wonderful views of the lake. Everything in the home was very well appointed, there wasn't a detail missed. We would recommend this home to anyone! 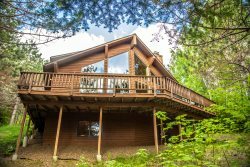 Beautiful cabin with excellent view of Lake Superior and morning sunrises. Furnished with everything that you would need. BTW the place was spotless upon arrival. Very nice condo, worked out great for our group. Good location and view.